This morning I got up early to make scones. The elderchild wanted something to take on an outing with friends and I wanted to do something with the last cup or so of wild blueberries. So I made peach-blueberry scones. Farmed: nothing really, unless you count the peaches, which were also Homegrown. Homemade: the yogurt in the batter, and the scones themselves. 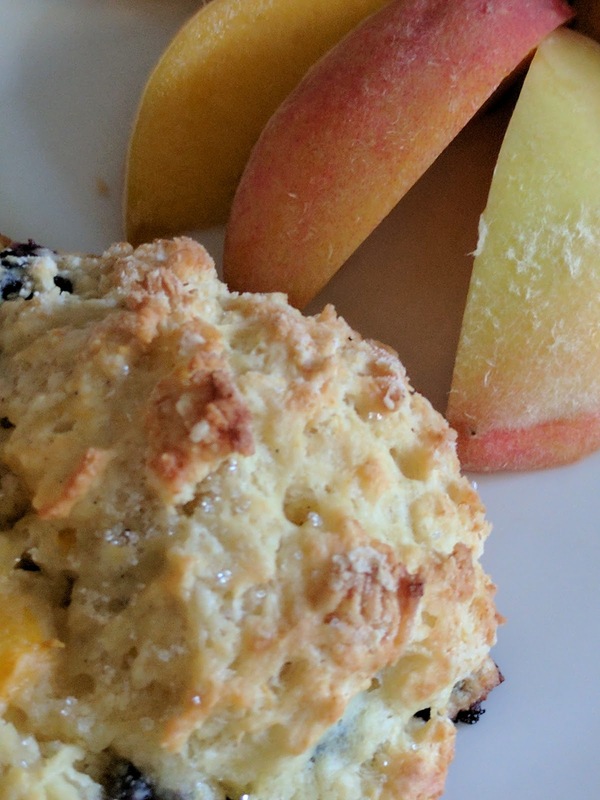 I used a standard scone recipe that used buttermilk or yogurt and was lighter than some other recipes I've tried. For the fruit, I chopped up one small peach and then added about half a cup of blueberries. Instead of nutmeg in the batter I used ginger. I could have used crystallized ginger instead, then you might have actually tasted the ginger. Regardless, because this was a lighter batter, after turning it out on the countertop for a quick knead, I ended up using a scoop to make the scones rather than patting it all into a disk and then slicing. They baked for 15 minutes at 400˚F and smelled heavenly! Now I've just finished up setting a batch of bread to proof. I'm going to try to pour a little melted butter into the loaves after I score them, just like those old commercials. It'll be interesting to see how that changes the bread.